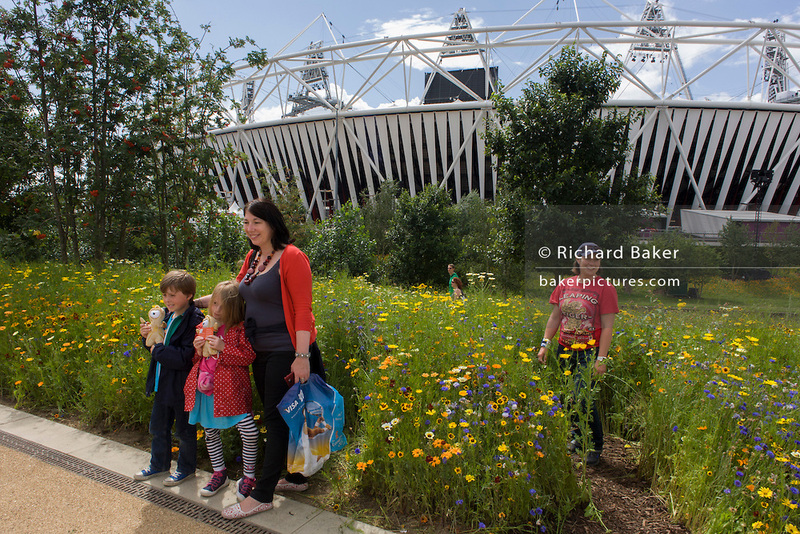 Spectators admire the Ribbon of Gold, 7 annual species of English garden flowers created by 100 staff with the main Olympic stadium in the background during the London 2012 Olympics. London's Olympic Park, at just under a square mile, is the largest new park in the city for more than 100 years. The planting of 4,000 trees, 300,000 wetland plants and more than 150,000 perennial plants plus nectar-rich wildflower make for a colourful setting for the Games. This land was transformed to become a 2.5 Sq Km sporting complex, once industrial businesses and now the venue of eight venues including the main arena, Aquatics Centre and Velodrome plus the athletes' Olympic Village. After the Olympics, the park is to be known as Queen Elizabeth Olympic Park.